Azzip Lafayette is officially open! I want to thank everyone who made this possible. It was a ton of work and a heck of a lot of fun. Opening a new store seems like it starts as a marathon, but it absolutely finishes in a sprint. If you all would have seen the store a week or two before we officially opened the doors, you’d be hard-pressed to believe we successfully hit our opening date. I want to officially thank Sam with Simon Construction and all of his team for the amazing job on the buildout. They hit a very tight timeline that we laid out without ever a bad word (that we heard!). Peters (our GM in Lafayette) and his entire team did an awfully good job of taking all the coaching and teachings from the seasoned Azzip vets and of learning the ropes on how to operate a successful Azzip Pizza. So we’ve now officially opened 8 Azzip Pizza locations (with 7 still open today) and each time has been a learning experience for us. We’ve had things that have been successful, and things that haven’t worked as well. So I’m here today to talk about some of the new things we did with this opening that worked well! I have two brothers that truly believe in the power of building a team in the stores. They believe that the culture we help establish amongst the team is a vital piece in creating a successful store. We need our teams to exude positivity, teamwork, a strong work ethic, and accountability to each other. We want them to be excited about coming to work, to have fun at work, and to provide our customers with great experiences. We set out to emphasize all of those elements on day 1 of training. Andy and Craig devised something they dubbed “Culture Night.” Culture Night isn’t about making pizzas; it isn’t about learning how to make our unique dough, how to prepare fresh veggies, or how to blend our house-made pesto. Culture Night is really about laying the groundwork for a store team that will enjoy working together and being around each other, in addition to providing the best possible service to our customers. 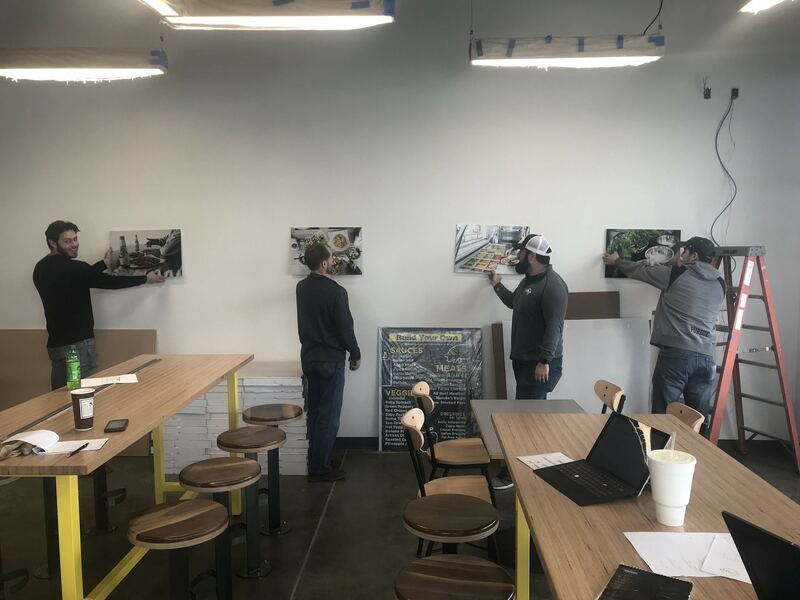 The format of Culture Night involved splitting our new store team members into smaller groups that got a turn rotating through each of our 4 customized stations. Station 1. Spaghetti and Marshmallow Tower Challenge. 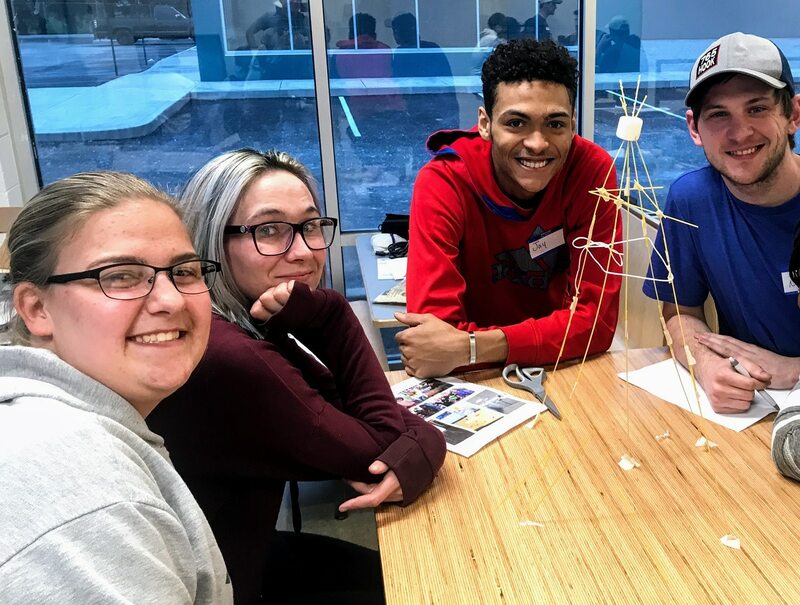 How tall can you suspend a marshmallow off the table using on 20 sticks of uncooked spaghetti, 1 yard of string, and 1 yard of masking tape… in only 18 minutes? The winning team on Culture Night suspended their marshmallow 19.6 inches in the air, which was 1 inch higher than my team did at the Azzip Home Office when we were testing this game out. Great work Jay, Nick, Alivia, and Bobbie! This event helped teams learn to communicate effectively, to work together as a team, and to encourage each other’s ideas. It also taught the groups how to balance planning with taking action, and how to “fail fast” so they could assess mistakes and make changes quickly. Station 2. AMA with Brad. This station was based around a popular aspect of the website Reddit where prominent figures, and those with interesting careers, lives, and perspectives join the site to answer questions. AMA stands for Ask Me Anything, and I had a ton of fun talking with the new team members and answering literally anything. Our team in Lafayette got a chance to ask me any question they wanted. From “How did you start Azzip?” to “What’s your favorite kind of dog?”, all the way to “Craig told me to ask you about that time you got trapped in a closet… so how’d you get trapped in a closet?”. Those kinds of things. Station 3. Overcooked. Yep, a video game. We brought the team through a station where they played a game on the Nintendo Switch called Overcooked, where little animated avatars are working together to cook tomato soup and (when you hit the more advanced levels) pizza. It’s a fast-paced game that requires a ton of communication, coordinated direction, and genuine teamwork. It can definitely be frustrating; you can accidentally set the kitchen on fire if things go awry (“Let it burn…” one frustrated team member mumbled after a raging kitchen fire started). Station 4. Telestrations. Another game :). Telestrations is a game that is basically the old Telephone game but with drawings instead of whispering. We got to know each other better based on the nature of the questions, and all had fun looking at Craig’s bad drawings. We also learned about the significance and impact of miscommunication and misunderstandings. Many of us at the home office grew up playing sports. We all have a competitive spirit and understand the importance of drills when practicing sports (or any activities!) to get better. You practice one small aspect of the overall game over and over again until you master that small piece. Then you move on to another small aspect of the game and practice that over and over again until you’ve nailed it. We did that with pizza. Practice Mats – We created styrene mats that had the sizes of each of our pizzas printed on them. 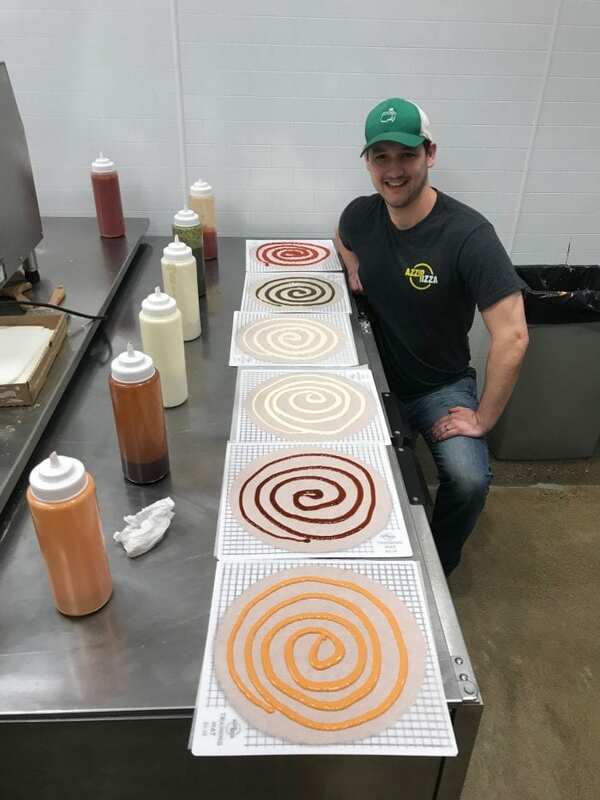 We then used these mats to practice drills putting on the sauce (6 crusts, 6 sauces: sauce each pizza crust with a different sauce and then get judged on time and accuracy), meat (practice putting meat on the pizza and then weighing it to see how close we came) and cheese placement, etc. We also did timed drills cleaning the dining room, making a 10 pizza order as a team, folding stacks of pizza boxes, and ringing up a customer order correctly. Combining the aspects of speed and accuracy was a big part of every training drill. We want our team to be able to work with speed, but also to do it right every time. All of the hard work and training culminated with actually getting real customers into Azzip and putting everything the team learned into practice. 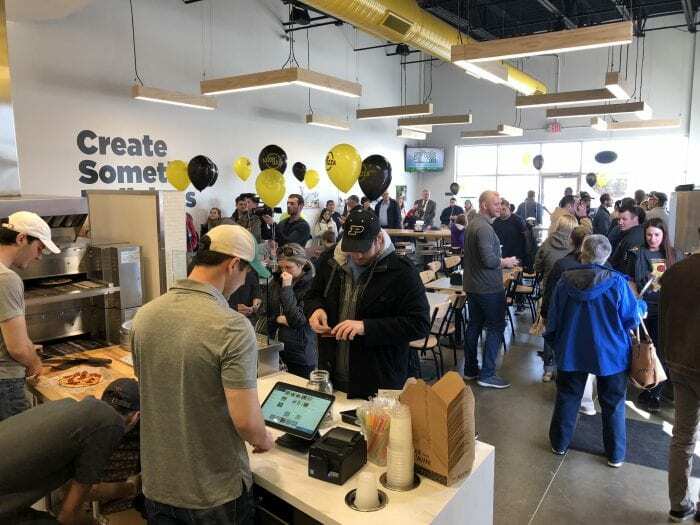 To celebrate Azzip Lafayette’s Grand Opening, we did a Free Pizza Day! 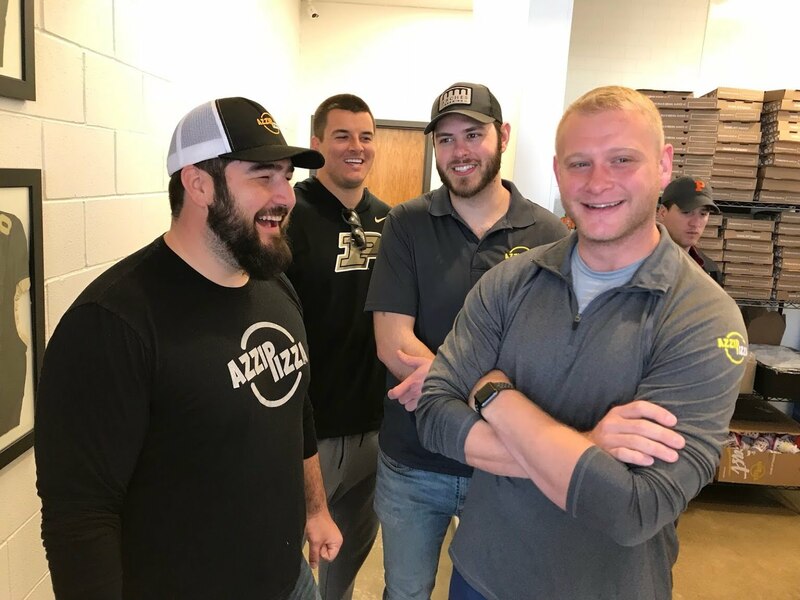 We even had a special guest, Washington Redskins OLB (and former Boilermaker great) Ryan Kerrigan, come and help pass out pizzas and talk shop with our customers! Thanks, Ryan! How many pizzas can a single Azzip give away for free in one day you ask? Great question! 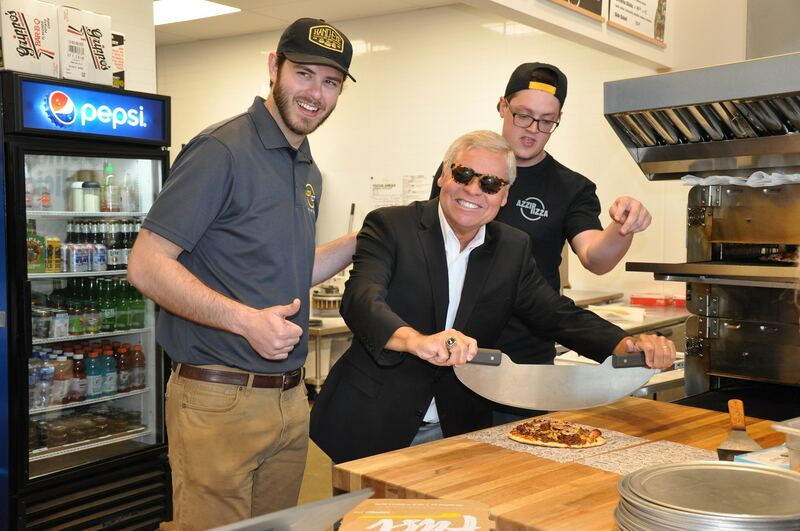 It ended up being 1,014 free pizzas given away with another 200 or so sold. That gave us a grand total of over 1,200 delicious, customized pizzas served in just one day. That’s over 112 lbs of cheese alone! The line of pizza-loving fans was wrapped throughout the entire store, out the side door, and down the length of the building for the entire day. The line didn’t make its way inside of the side door for the entire 10 hours we were open! It was incredible meeting everyone that came and supported us on our first day. We feel incredibly lucky to have had that support for our Grand Opening and in the days since. We always knew that Lafayette was a great community, and we are very excited to finally, officially, be a part of it! Thank you again to everyone who helped make this happen and to all of you who’ve supported us after opening. We are grateful for the support and all the enthusiasm you’ve brought with you. 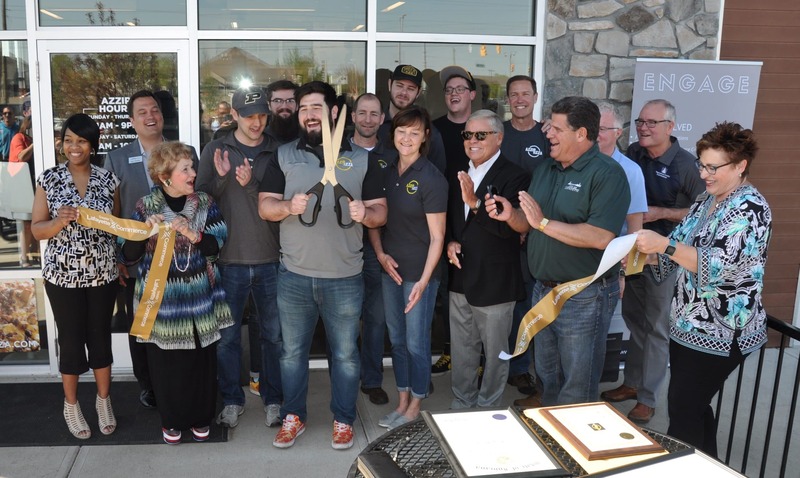 We would also like to thank all of the local business leaders and Chamber representatives who supported our ribbon cutting with special thanks to Mayor Tony Roswarski, Indiana House Rep. Sheila Klinker, Senator Ron Alting, and Chamber Engagement Director Jake Franklin for their kind words, honorary resolutions, and cutting the first pizza of the day with style! We’ve got a great team in place in Lafayette and are sure they are going do big things.